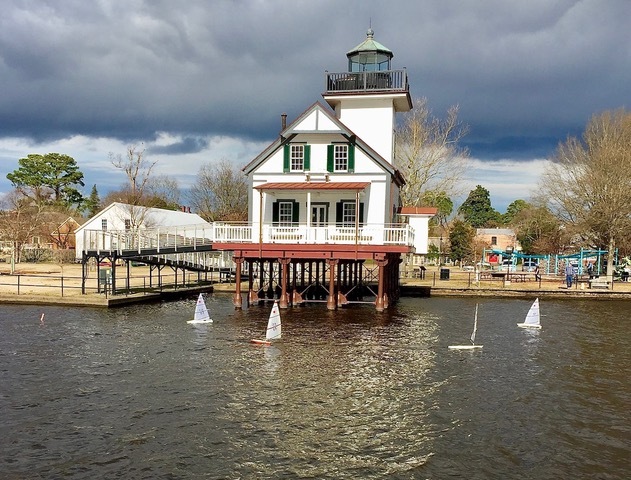 Five steadfast RC Laser sailors turned up for the January 1, 2019 Hangover Cup in Edenton, NC on a spectacularly nice winter day: temps approaching 70 deg, partly cloudy skies with B-rig west winds. Seems like the rest of the gang forgot the first rule of winning regattas: BE IN the regatta. With unusual west winds (SW is more typical), four possible venues in Edenton were available to us. We chose to sail in the harbor where we set a nice windward-leeward course roughly parallel to the breakwater. This gave us the rare benefit of being able to walk alongside the course and see not only the start line well but also the windward and leeward marks. We could have set a course outside the breakwater but there was considerable chop outside; we opted to sail inside where the water was somewhat flatter. Over the course of the afternoon the wind veered slightly north, just enough for the lighthouse and adjacent structures to scramble the flow. In addition to becoming more turbulent, the wind on the water was gusty. Sometimes you’d be knocked down, sometimes left in irons, sometimes in a 90 deg header. None seemed to last long enough to get a grip. While many struggled for traction, Michael Roberson clearly adapted best to the dynamic conditions with 7 wins out of 9, the clear Hangover Cup Champion. Thanks to everyone for helping to set and retrieve marks, and also to Tony for the beer! You who missed it, work on your planning for next year – the Hangover is always on January 1.